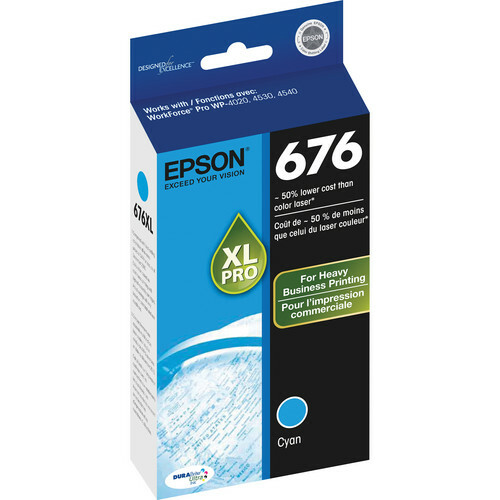 Box Dimensions (LxWxH) 7.0 x 3.5 x 1.0"
676XL Cyan Ink Cartridge is rated 5.0 out of 5 by 3. Rated 5 out of 5 by Robert from Epson Rules Epson ink colors are terrific. Larger cartridges last so much longer and are really appreciated as compared to replacing ink so frequently. Rated 5 out of 5 by Tyrone from Long lasting ink Ink cartridges produces quality prints (graphics and texts). Ink cartridges last a longtime, which translates into a cost savings.